We offer Whole Leaf Organic Green tea from famous organic tea gardens in Darjeeling like MIM (Andrew Yule). The Whole Leaf teas are to be used 2-3 times over 6-8 hours. 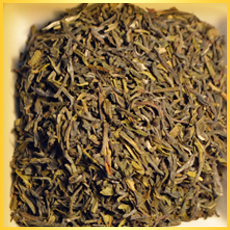 Darjeeling Green Classic: These are available in 100 Gms, 50 Gms and 20 Pyramid teabag packs. The Whole Leaf teas require a lot of space for unfurling/expansion during brewing, and normal teabags don't allow such space. Therefore, we use pyramid shaped teabags. We have some other Green teas e.g. Peach, Mango, Arabian Mint, Autumn, Jasmine, Englishe Orchard, Earl Gray. These are available only in bulk loose packaging. You need to contact sales@budwhitetea.com for these teas. You can buy these teas from our online store as well as various high-end retail outlets. Green tea refers to the tea that has undergone minimal oxidation. It is ranked as a leading health-giving substance in traditional Chinese medicine. Scientific research is now proving that these benefits are due to the antioxidants present in abundance in green tea. For green tea production once the tea leaves are plucked they are laid out to wither for about 8 to 24 hours. This lets most of the water to evaporate. Then in order to neutralize the enzymes to prevent oxidation, the leaves are steamed or pan fried. The leaves are then rolled up in various ways and tightness, after which a final drying takes place. From there it goes off to be sorted, graded, and packaged. Green teas, like white teas, usually have more of a vegetative or herbaceous quality than black or oolong. How did Green Tea get its name? Green tea rarely brews as green - rather, the name refers to the colour of its leaves, which are green. Green tea usually has a yellow appearance when brewed. Generally this tea has a fresh, light taste. Some varieties have a taste reminiscent of grass.Because both green and white teas are so gently treated, they retain the beneficial antioxidants of the tea shrub. Green tea refreshes the body and mind and has a low content of caffeine. Studies show that 4-6 cups of green tea a day speeds up metabolism and reduces stored fat, lowers cholesterol levels, reduces the risks of heart disease and cancer, and helps maintain good digestion. You can buy these teas online from our online store.